Tomatillos are not an ingredient that I use very often. These hard green relatives of tomatoes may be eaten raw, but they are a key ingredient to salsa verde. This Sunday, I decided that I would try making the Mexican restaurant staple, chili verde. To go with my chili verde I made refried beans, Mexican rice, pickled red cabbage, and guacamole. This dish is most commonly made with pork and this is simply called “chili verde.” However, if you use the same sauce with beef it is called “chili verde con carne.” When made with chicken or as a vegetarian dish, the main ingredient comes first—“chicken chili verde,” etc. Almost all of the recipes for chili verde start the same—cut the meat into chunks, salt it, and fry it to get a good browning. I thought there might be a way to skip this hazardous and messy step. Braising in the oven will brown the meat that is not submerged in the liquid. Tip: According to Cook’s Illustrated you do not need to pre-brown the meat if you are braising and the meat is not going to be completely submerged. The exposed meat will brown on its own during the long cooking time. In the article, they say it is almost as good as pre-browning in creating the Maillard reaction, the source of the complex flavor of a good beef dish—in a recent video they simply said that it was just as good. I looked at several recipes on-line, but I did not really follow any of them. This is not meant to be an “authentic” version of this dish. I followed my own experiences adding ingredients that would make it the most delicious—authentic or not. Note: One trick you may use with this recipe is to cook the meat the day before. The meat will still be moist and tender the next day. Doing the meat the day before also has the added benefit of making it easy to separate out the lard, which you can then use for cooking the vegetables. 1. Trim pork into 2 inch cubes and remove excess fat. 2. Put the fat into a small pot and render into fresh lard. 3. Sprinkle the meat with 2 teaspoons of salt and the soy sauce. Toss the meat to coat all sides of the pork. 4. Marinate the meat for at least one hour. Note: Start preparing your verde sauce five hours before dinner, unless you cooked your meat the day before. If so, start the sauce two hours before dinner. 5. Cut the tomatillos in half and toss them with the lard and whole garlic cloves. Tip: Remove the outer husks and wash the sticky film and any dirt off of the tomatillos. Trim away the stem core and any soft spots. Note: Tomatillos should be light to dark green and firm all over. 6. Spread the tomatillos and garlic on a baking sheet and add the rinsed chilies. Tip: Lining the pan with aluminum foil helps with clean up. 7. Broil the vegetables for 15-20 minutes until the tomatillos are soft and spotted, the garlic is golden and the chilies are blackened. Tip: Turn or stir the vegetables occasionally, so that the sear evenly. Note: You may need to remove some of the vegetables sooner than others. 8. Put the chilies into a plastic bag, while they are still hot. Tip: The steam loosens the skins and makes them easier to peel. 9. While the vegetables are broiling, grease a Dutch oven and add the pork and beer. Toss to coat the meat. Tip: The pork should not be completely submerged in the liquid. Depending on the size of your Dutch oven and the volume of your meat, start with one cup of beer. Add the rest later as it evaporates to keep the fluid level about half way up the meat. 10. Put the Dutch oven in a 500º F pre-heated oven, immediately turn the temperature down to 350º F.
Tip: If you broil the vegetables just before inserting your Dutch oven it will have done a nice job of preheating the oven. Note: Do not cover the Dutch oven. For the this browning trick to work the air around the meat must be dry. I had forgotten this aspect of the technique and my meat did not brown properly. Below, I will give the technique to recover from this mistake. 11. Braise the pork for 2-3 hours. Tip: Stir the pot every half hour, so that the submerged pork has a chance to brown, and check the liquid level. Add more beer as needed. 12. When the vegetables have cooled, peel and deseed the chilies. Tip: Discard the hard caps of the chilies. 13. Coarsely chop the tomatillos, garlic, and chilies. 14. Put the cooked vegetables in a standing blender and add the cilantro stems. 15. Pulse the blender several times to produce a coarse paste. Tip: You do not want it to be paste to be completely smooth, but you do not want big chunks either. 16. Transfer the sauce to a bowl and reserve, covered in plastic, in the refrigerator. 17. After the pork has been in the oven for 2½ to 3½ hours, remove the pork to a plate and de-fat the pot liquid. Tip: Putting liquid in a small bowl in the freezer will quickly harden the pork lard and make it easy to separate. A fat separator may be used if you are short on time. Note: As I said earlier, my meat had come out pale. By covering the pot the meat was in a wet environment which prevented the Maillard reaction from happening. I added a bit of the lard to a frying pan and I fried the pieces of pork over a high heat for three minutes per side. If you end up needing to do this do not stir the pork pieces in the pan! The meat will be so tender that it will shred into tiny pieces if you handle it too roughly. Lay the meat chunks in the pan, fry on one side and then gently flip them to fry the second side. Carefully, transfer the pieces to a plate. 18. Add a tablespoon of grease to a medium pot and put it over a medium heat. Tip: If you have remove your pork from the Dutch oven, you may reuse this pot without cleaning it. Otherwise use a separate medium pot. 19. Sauté the onions with the rest of the salt until soft, about five minutes. 20. Pull the onions to the sides of the pot and add the garlic and tomato paste. 21. Cook for two minutes, until the garlic is fragrant and the tomato paste has started to darken. 22. Stir in the tomatillo mixture, the Mexican oregano, and the black pepper. 23. Simmer, stirring, for two minutes to meld. 24. 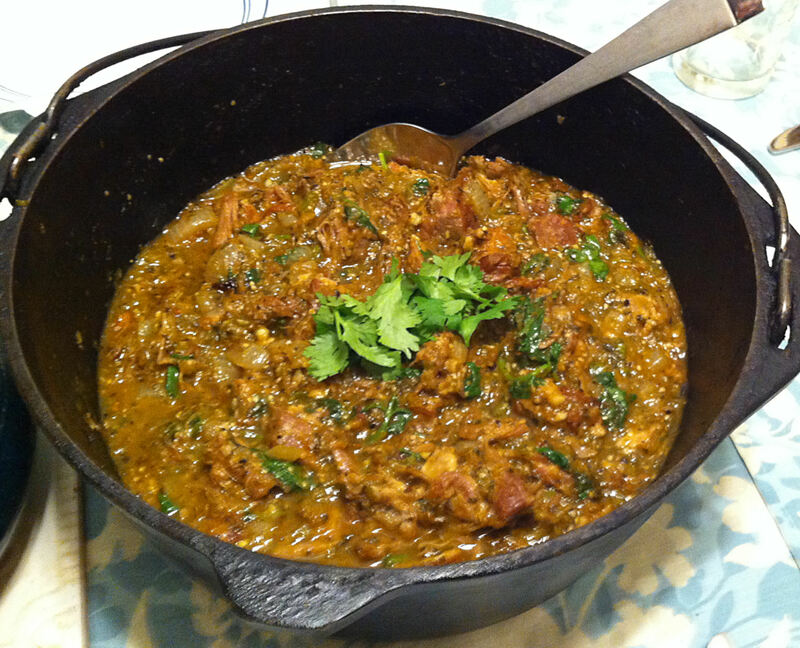 Return the pork to the Dutch oven with the chili verde sauce and gently fold them to mix. Tip: If the sauce seems too dry you may add some more beer, water or chicken broth. 25. Return the pot to the oven, covered, and continue baking for one to two hours. Tip: Stir the pot as little as possible, so you do not break up the meat chunks. 26. Five minutes before serving remove the pot and fold in most of the cilantro leaves and the lime juice and zest. Tip: Reserve some of the cilantro leaves as garnish. 27. Serve directly from the Dutch oven with tortillas on the side. Tip: You may also like to have lime wedges on the side, for those who want just a little extra boost.